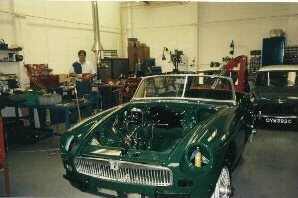 This page is about an MGB restoration I did in 1992. This is the wreck as received. The engine and gearbox are out and the hood and doors have been removed to see if the shell was salvagable. As you can see it was beyond any help! The bodyshell was paper thin and very,very rusty. The chassis was almost non-existent,the wheels and chromework were in a terrible state. The trim, tyres and seats were all rotten,the carpets were long gone as were the door trims. This was not unexpected as the car had been left outside on a driveway with no cover for 7 years! The owner wanted the car to be kept as original as possible!!! 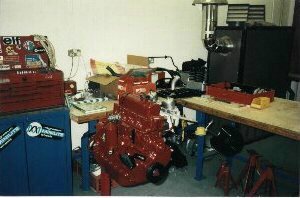 The engine, gearbox, axle and suspension wishbone units were all shot blasted, rebuilt and repainted to factory spec. 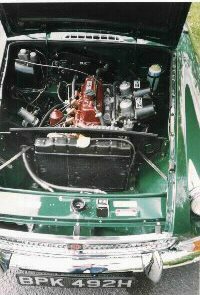 While rebuilding the engine, it was 'breathed' on.The head was re-worked with larger valves, ported and polished and a Group 2 cam fitted, the manifolds were matched and polished and the S.U. carbs rebuilt. As you can see from the photo all parts were refurbished to 'as new' condition. 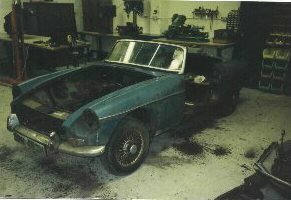 As the bodyshell was beyond repair, a new one was bought from Heritage Bodyshells. These are made using the original mould pressings from the factory. All brightwork was re-chromed or replaced, the wheels were re-furbished and the suspension units replaced with modern telescopic shock absorbers and new springs. You can see these units through the headlamp hole.This modification transforms the handling of the car! As can also be seen from the photo the wiring, pipework and ancilliary items were all rebuilt or replaced. All the bit and pieces, labels and stickers are as the original factory specification. This is it in all it's glory, it drove as well as it looks. 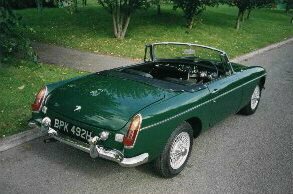 It is finished in British Racing Green, with red piped black leather trim. The bumpers and light units are new as are the badges and door/boot handles. The dashboard and instruments were refurbished by me as was the windscreen surround and quarter lights. The hood and tonneau cover are new as are the carpets, the seats and door panels were recovered by me. The exhaust is a 'straight through' system and sounds glorious. The braking system was all renewed, with new discs and calipers, with uprated pads and rear shoes. The total rebuild cost £8,500 in 1992, and took 6 months to complete. The owner was over the moon when he saw the car,as I would not let him see it until it was finished. 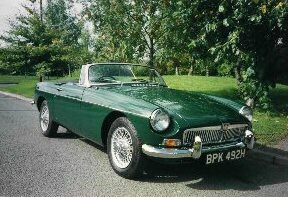 He took it to an MGB anniversary meeting and was offered £15,000 for it!!! - which he turned down. He still owns the car to this day, and in all fairness it still looks as good as when he collected it from me. That's me lurking in the background.